"When I was young, I watched my uncle oil paint on the riverside. The tourists used to buy his 5x8 paintings for a very small fee. 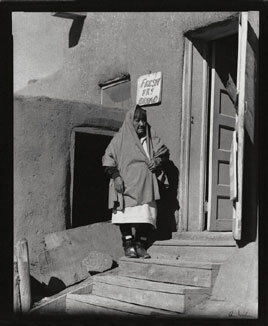 I also helped my uncle in his shop (where I am now); he was the very first individual to have a shop at the Pueblo. I gained a lot of experience in working with people and meeting people from all over the world. Even now more." "I got to see the better things in life. I am fortunate to have had the opportunity to express myself through the many talents that were taught to me. The bread baking, various cookies, pies of different ingredients, the bead work in jewelry and dress. The pottery making and design and most of all the ability to better educate my mind in order to associate with people. This came at an early age of 14 when I started helping my uncle, Albert Lujan, at his studio. I have been in this business ever since." "I still participate in all our cultural activities within the community." "I'm used to people and tourists asking to take my picture; although they pay me a small fee. Sometimes I wonder if they sell or make money from my photos." "I hope that my family keeps up the traditions in this manner as a way of making extra money and also to teach their children the ways of our heritage."